What is the CLV Development Triangle Area? With globalisation in full force, more and more Southeast Asian countries are beginning to realise the importance of economic cooperation for the sake of economic growth. This is in contrast to what is happening in the West as countries like the United States (US) roll back on its free trade principles and the United Kingdom (UK) pursues its separation from the European Union (EU) via Brexit. Back in March, the Prime Ministers of three neighbouring ASEAN countries Cambodia, Lao PDR and Vietnam (CLV) met and endorsed an action plan to connect their economies until 2030. The three leaders committed themselves to building “integrated, sustainable and prosperous CLV economies” which would be located in the larger regional plan of the ASEAN Community Vision 2025. The meeting took place in Hanoi as part of the 10th Cambodia-Laos-Vietnam Summit on Development Triangle Area (CLV-DTA). First established in 1999, the CLV-DTA initially covered just 10 border provinces within the three countries. Later in 2009, the three countries decided to add three more provinces from each country to make it a total of 13 provinces. At this year’s summit, the three Prime Ministers agreed to gradually expand the triangle area to cover all the territories of the three countries. Over the past decade, all three countries have grown rapidly – Cambodia has seen a steady average growth of seven percent, Vietnam has transformed from one of the poorest nations in the world to one of the wealthiest economies in the region, while Lao PDR has been described by the World Bank as one of the fastest growing nations in the region. The reasons for growth vary from country to country, but the role of the CLV-DTA has been largely underrated. The good relationship between these countries has eased the inflow of investments among them. Vietnam for example, has invested in 113 projects worth about US$3.6 billion in the border provinces of Cambodia and Lao PDR (65 projects in Lao PDR and 48 in Cambodia). Vietnam has also assisted in terms of infrastructure funding. Previously, Vietnam gave Cambodia a concessional loan of US$26 million to build a 70-kilometre (km) road connecting Banlung to Ou Ya Dav. Vietnam has also benefitted greatly from the CLV-DTA. In his speech at the summit, Vietnam’s Prime Minister Nguyen Xuan Phuc highlighted that five Vietnamese provinces in the CLV-DTA had attracted 233 projects from 20 countries and territories with a total registered capital of US$2.3 billion. The CLV-DTA has proved to be useful in developing partnerships too. According to a paper by Vannarith Chheang from the ISEAS-Yusof Ishak Institute, Japan has been the main supporter of the CLV-DTA, pledging US$1.5 billion to the partnership for the development of CLV countries in areas such as education, irrigation and infrastructure during its early days. In 2015, Japan provided an additional US$18 million. Aside from that, the Asian Development Bank (ADB) has also provided plenty of support to the CLV-DTA under the Greater Mekong Subregion framework. During the summit, the ADB proposed some strategies to further support the CLV-DTA. Among them includes helping CLV countries with issues of infrastructure gaps through the development of economic corridors with both, public and private investment. Undeniably, the CLV-DTA also carries a geopolitical role – especially for Vietnam. It is the de facto leader of the triangle due to its political stature and its relatively advanced economy. Vietnam is taking advantage of this agreement to bolster its influence in the region. 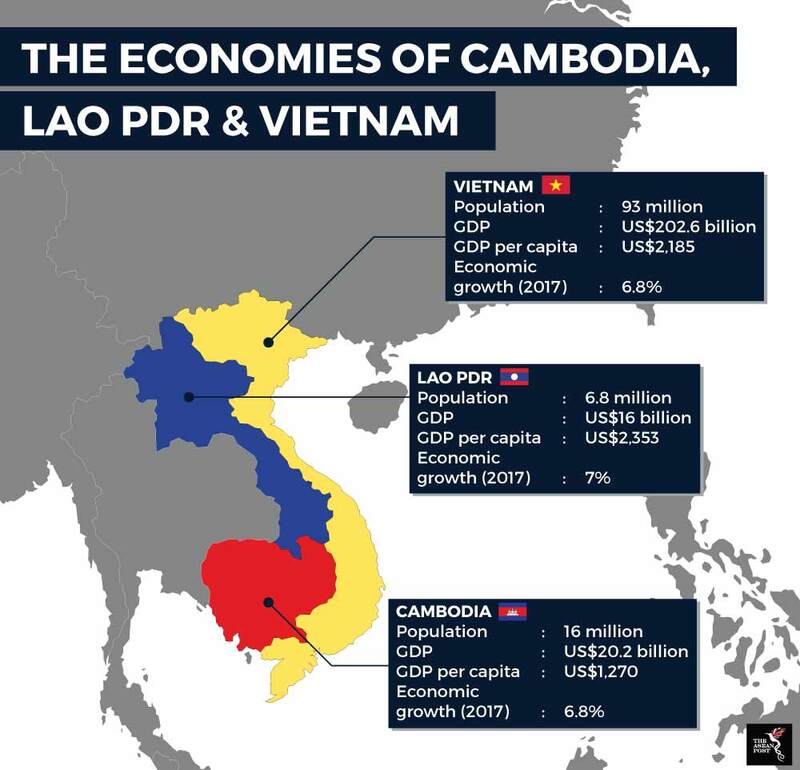 According to Vannarith, “Vietnam is concerned about China’s increasing influence in Cambodia and Laos.” The expansion of the triangle from just 13 provinces to eventually the whole of all three countries would further increase Vietnam’s influence within the region. The CLV-DTA has seen some success, but its potential has yet to be completely realised. The role of the CLV-DTA isn’t just about economic cooperation but has expanded to cooperation over security as well as social and cultural development. In this regard, the triangle can still do more. Poverty rates in Cambodia and Lao PDR are still higher than in most neighbouring countries. This should be one of the main priorities for the CLV-DTA given the fact that the Mekong river passes through all three countries. Ultimately, the CLV-DTA is still finding its way but the current level of cooperation should be commended. The consensus seen at the CLV-DTA summit is exactly what is lacking throughout the rest of ASEAN. If the CLV-DTA offers just a glimpse of what the ASEAN Economic Community could become, then, the future of the region is assured. What does China mean to Cambodia?